Human peripheral lymphocytes stained with Multi-Colour Human CD4/CD38/CD3/HLA DR flow kit (4C006). 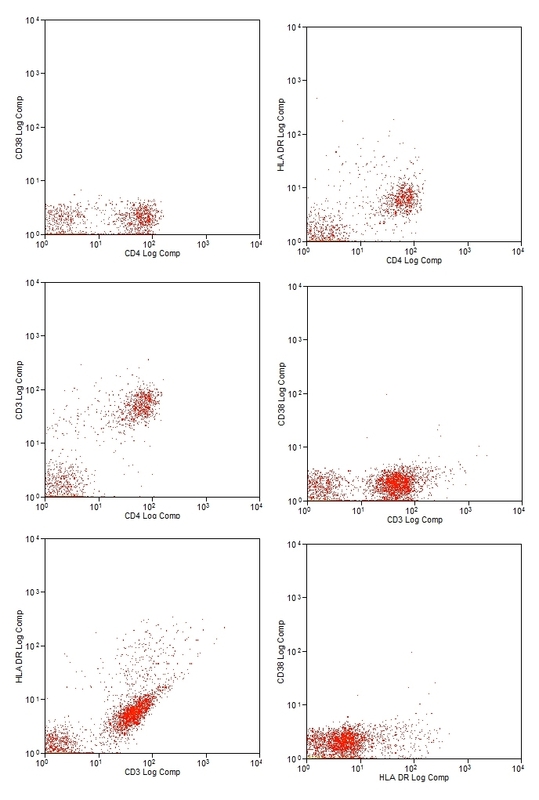 Four-Color Human CD4/CD38/CD3/HLA DR Flow Kit can be used for single-step identification of activated helper/inducer (CD3+CD4+CD38+ and CD3+CD4+HLA DR+) T-cell subsets. CD38, otherwise known as cyclic-ADP ribose hydrolase 1, is a type II integral transmembrane glycoprotein and member of the ADP-ribosyl cyclase family, which is widely used to study the processes of B- and T-cell differentiation and activation. Increased expression of CD38 on both CD4+ and CD8+ T-cells in HIV-infected patients is associated with disease progression. HLA DR is a heterodimeric cell surface glycoprotein and human class II MHC (major histocompatibility complex) cell surface receptor, consisting of a 36 kDa alpha and 27 kDa beta chain, which is essential for efficient peptide presentation to CD4+ T-cells. HLA DR is expressed primarily by antigen presenting cells and, together with CD38, is a useful marker of T-cell activation following viral infection. Clone YE2/36-HLK recognises a monomorphic determinant of human HLA DR.
Four color combination consisting of APC, FITC, RPE-Cy5.5 and RPE conjugated monoclonal antibodies mixed in optimal ratio - lyophilised.